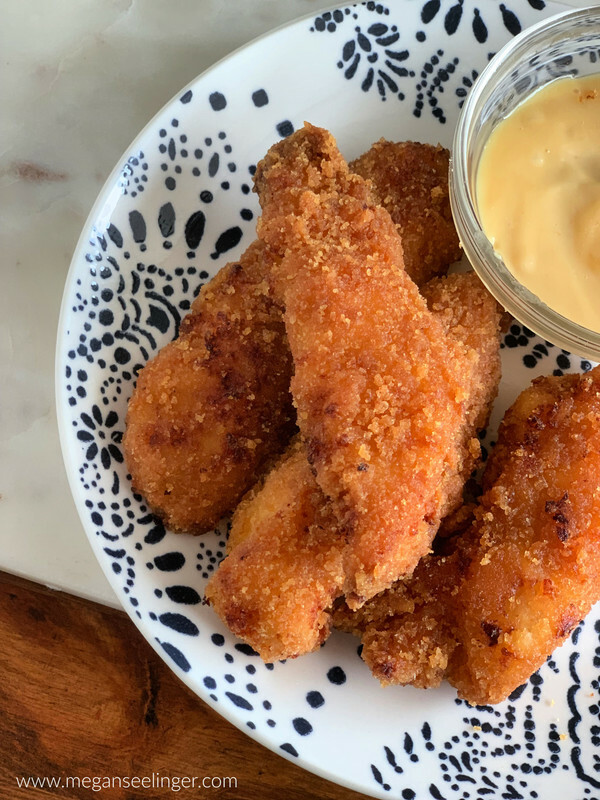 This Keto Fried Chicken almond flour recipe will make the perfect Keto fried drumsticks, Keto fried chicken breast or low carb chicken tenders. 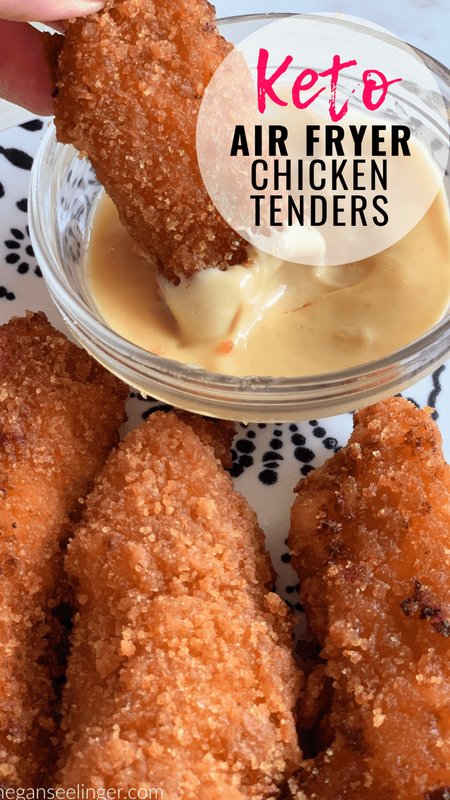 Originally the recipe was intended to be pan-fried chicken tenders, but I discovered it’s also an easy Keto air fryer recipe too. Don’t you always crave Chick-Fil-A on a Sunday? Which is probably for the best since Chick-Fil-A's fried chicken isn’t exactly on your low carb diet! What’s Chick-Fil-A’s Secret Fried Chicken Ingredient? Pickle juice! The first step to the recipe is to marinate your chicken in a big jar of pickle juice. The longer you can marinate it the better, so I recommend letting it marinate in the fridge overnight. So what exactly is the point of the pickle juice? Brining it in the pickle juice helps the chicken retain moisture, so it makes the chicken nice and juicy! Plus it adds some flavor that resembles Chick-Fil-A’s recipe. You want to be sure you get regular dill pickles, not bread and butter because the bread and butter will have sugar added to it. How to make fried chicken with no breading? The really good news is that on a Keto diet there are great substitutes for ingredients like flour and breadcrumbs, which are the main ingredients needed to make fried chicken. If you follow a Ketogenic Diet you probably already have almond flour in your pantry! I use Now Foods Raw Almond Flour it’s 100% pure, unblanched, gluten-free, and obviously low in carbs, making it a perfectly healthy, and tasty alternative to bleached white flour. It’s a staple ingredient in a lot of keto desserts and other recipes too. Now my discovery that really made these low carb fried chicken tenders is Pork Panko, made from finely ground pork rinds. It’s the best replacement for breadcrumbs that I have found. 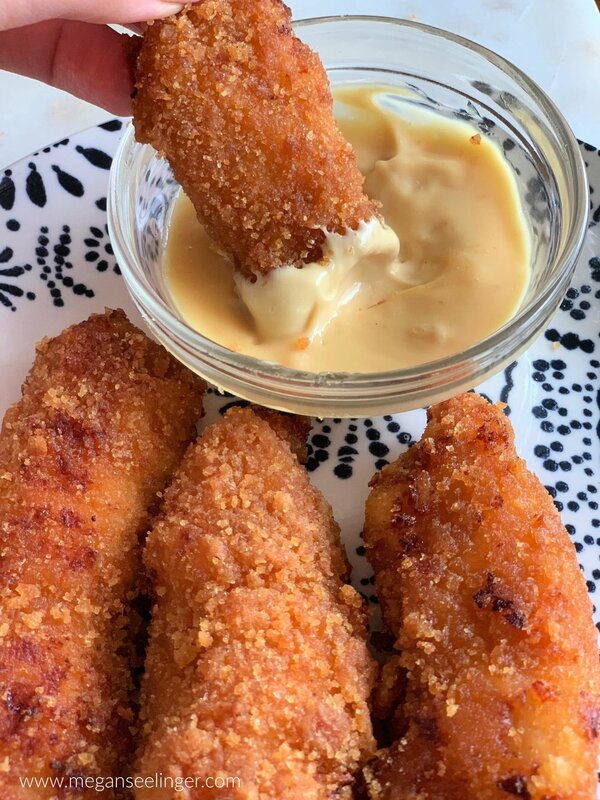 The pork panko gave the chicken tenders a perfectly crispy coating without being too crunchy or flaking off during the assembly and cooking process. Since the pork panko is made from pork rinds, it has zero carbs! *I have tried making these fried Chicken tenders by grinding up pork rinds myself, and the recipe didn’t turn out the same. The pork rinds are too moist so it won't stick to the chicken as well, and the “breading” won’t be as crispy. Once the oil is hot place tenders in oil and cook about 3 minutes on each side or until golden brown. Cooking time will vary depending on the thickness of your tenders, breast or drumsticks. Now for the Air Fryer Fried Chicken, set the air fryer to 375 F and cook the chicken for about 15 minutes. PRO TIP: To prevent a disaster, Be sure that you use one hand for dipping in the wet ingredients and the other hand for dry ingredients. For example, use your “wet hand” to pick up the chicken, drop in the almond flour mixture, then with your “dry hand” be sure the chicken is fully coated and move to the egg mixture, with your “wet hand” make sure the chicken is thoroughly coated with the egg, remove and drop into the Pork Panko, Finally use your dry had to remove from pork Panko. Is Fried Chicken Low Carb? Usually Fried chicken is not Keto approved. One Chick-Fil-A Chicken strip has 22g Carbs. Yikes! However, this Low Carb Fried Chicken Recipe is totally Keto Diet friendly. Each Keto Fried Chicken Tender is 193 Calories, 9g of fat and 26.8g of protein. The only thing you need to be cautious about is the protein, remember Keto is moderate protein, so I’d only eat one or two of these tenders per meal. You Can’t have Chicken Tenders without Chick-Fil-A Sauce. I might be slightly obsessed with Chik-Fil-A sauce. I use to ask for extra packets and eat it on literally everything! #truestory. So I made a Keto friendly version of Chick-Fil-A copycat sauce made with mayo, mustard, lemon juice, Honey Trees Sugar-Free Honey, Organicville BBQ sauce. 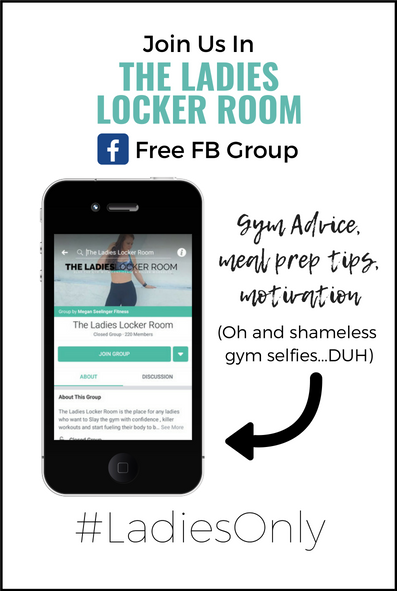 Full instructions below! Put chicken tenders and pickle juice in a large zip lock bag and marinate for at least 1 hour, preferably overnight. Once the oil is hot place tenders in the oil and cook about 3 minutes on each side or until golden brown. Set the air fryer to 375 F and cook the chicken for about 15 minutes. I have tried making these fried Chicken tenders by grinding up pork rinds myself, and the recipe didn’t turn out the same. The pork rinds are too moist so that they won't stick to the chicken as well, and the breading won’t be as crispy.